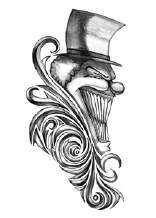 Tribal Iron Clown Fun Tattoo. Der stählene Clown aus unserer Tribal Iron Tattoo Serie. Iron Clow Tribal del tatuaje temporal. Iron Tribal Clow Temporary Tattoo.